Our 20/21 Vision Plan is a roadmap for developing the local economy. It explains how we are addressing urban blight, increasing housing options, attracting new businesses, and creating a thriving community. The plan is sustainable and environmentally friendly. Leadership in Energy & Environmental Design for Neighborhood Development (LEED-ND) granted it conditional approval, making Mapleton-Fall Creek the first neighborhood in Indiana to receive conditional LEED-ND approval. View the 20/21 Vision Plan. According to the Project for Public Spaces, a city must have a number of great places to be a community where people choose to live, work, and play. People want opportunities to take pleasure in public life. Indianapolis has some great places to be sure: Fountain Square, Irvington, Broad Ripple, Downtown, and others. But, we need to be more proactive in growing these places as we continue to compete both regionally and nationally. Great Places 2020 is a program created to respond to this need. The effort seeks to transform strategic places in Marion County into dynamic urban villages. These places already have great assets and potential, but they also have challenges that this process hopes to assist with. Philanthropic, civic, and private partners will engage with neighborhoods to make significant social and capital investments to enhance quality of life and spur private investment. 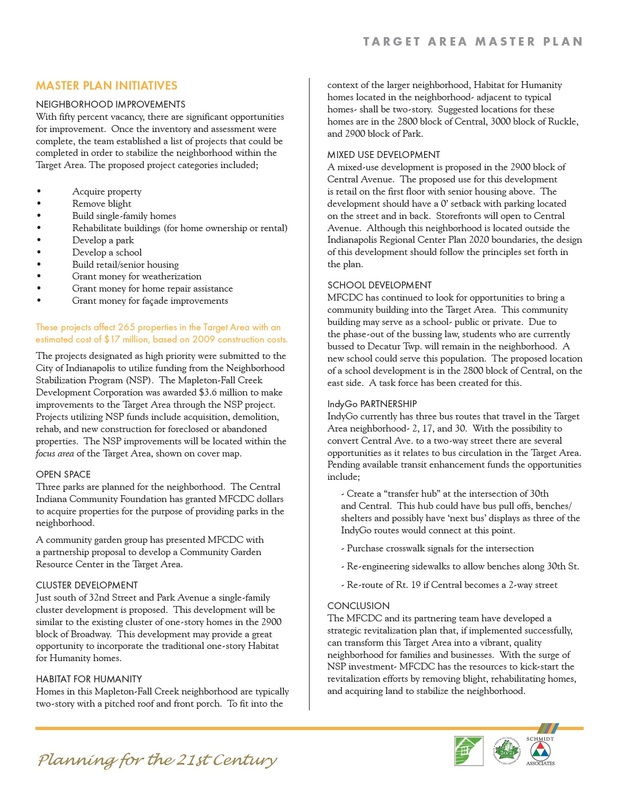 The neighborhood surrounding 38th and Illinois, now known as Maple Crossing, the neighborhood located at 38th and Illinois is one of the first places to engage in this effort. It was selected for its potential, unique assets, and location within a number of active neighborhoods. With the input of neighbors and community partners, a plan was created to improve the Livability, Opportunity, Vitality, and Education in the community. Encourage walking, bicycling, and transit use and discourage excessing motoring speeds. Turn Tarkington Park into a world-class destination urban park and enhance the physical and natural environment.